Promoted: Yamaha MusicCast bundles of joy | What Hi-Fi? Many wireless multiroom systems are closed shops. You buy the speakers, and the rest of your kit becomes redundant. Yamaha’s MusicCast range lets you bring all your hi-fi stuff to the party. Anything you plug into it can be beamed to any other MusicCast speaker – any CD player, any turntable, anything with an output. Every MusicCast component is a Bluetooth transmitter too, so you can wirelessly stream music to your existing Bluetooth devices. The best part? All the products mix-and-match – so your system can grow as you want it to. And you can control it all from your smartphone with the free MusicCast Controller app for iOS and Android. The YSP-1600 soundbar features Yamaha’s Digital Sound Projector tech for 5.1-channel surround-sound without the speaker-clutter, while the compact WX-030 speaker brings quality audio – and instant listening – to any room. The stylish ISX-80 Restio speaker can be wall-mounted for a touch of extra style. If you’re more about music than movies, the Duo package – with the WX-030 and Restio speakers – is the one to go for. They’re both compatible with Spotify Connect, Bluetooth and Apple AirPlay, and both can handle high-res material up to 24-bit/192kHz… so fire up your digital music collection and get listening. Want to watch a movie in more than one room? 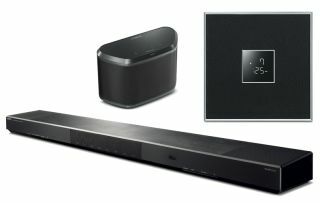 You can send audio from anything connected to the soundbar – including TVs, set-top boxes, consoles and more – to the other speaker in another room. And, of course, you can use them separately with Spotify, Bluetooth, network audio and more. Click here for more information about the full range of Yamaha MusicCast compatible products.